To those considering making an order, we at HIRO YANAGIMACHI Workshop would like to present to you our approach to shoes and shoemaking. We offer 3 order methods, based on the way the last is created. Here we provide information to find the method most suitable for you. Here we introduce our complete product range, with more than 50 types of shoes and boots including classic designs and our unique creations. There we present our latest informations including overseas trunk shows. There we present our latest updates, show how we make our shoes, and introduce ourselves. Thank you for visiting the HIRO YANAGIMACHI website. 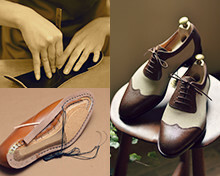 We are bespoke shoemakers located in Tokyo, Japan. In Japan, there is a belief from ancient times that spirits dwell in all things, like mountains, water, wind and fire. Furthermore, it is believed that the true essence of something is not found in what you see, but rather in what you cannot see, such as in the feelings or spirituality present in an object. These ideas are also reflected in HIRO YANAGIMACHI shoes. Our shoes are not just products. They are what we submit from ourselves to the world, containing our sense of purpose and pride. 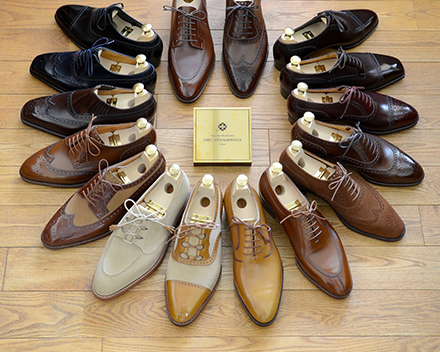 We put our soul into our shoes so that our customers will be satisfied. Japan, and especially the capital city Tokyo, is a place where tradition and innovation mix. HIRO YANAGIMACHI shoes are based on traditional shoemaking knowledge and techniques, but this does not mean returning to, or remaining in, the past. In a time of continuous change, we look to the present and future in order to respond to customers’ modern lifestyles and needs. While carrying on the essence of shoemaking tradition and bearing in mind our responsibility to preserve it, we continually challenge ourselves and always aim to innovate. For us, the customer is most important above all else, and we believe that making shoes that will satisfy our customers is our sole and greatest purpose. We treat each and every customer equally and respectfully, sparing no effort to fulfill the trust given to us to make a pair of shoes. Facing our task with sincerity, we strive to ensure the best quality not only with our shoes, but also with our overall service towards our customers. For me, making shoes is my profession, my life, and who I am. I believe that shoemaking, more than being the work of "making an object" that is visible to the eye, is really the work of "instilling the thoughts and feelings" from ourselves and our customers into an object. If the shoes that we make, containing these mutual thoughts and feelings, can be even a little bit helpful to the lives of our customers, that is the greatest satisfaction for us at HIRO YANAGIMACHI. Bespoke Shoemaker HIRO YANAGIMACHI Tokyo © Copyright Hiro Yanagimachi All Rights Reserved.